Miami, or “Sweet Water” in the Creek Indian language, is one of the newest cities in the United States. While northern Florida was fought over by European powers and finally taken by the Americans as part of the slave-worked plantation South, Miami lay largely ignored and populated by more alligators than humans until its incorporation as a city in 1896. The driving force was Henry Flagler, who brought his railroad down to Miami and from there to Key West—and trade with Cuba. Once settled, “Tin Can” tourists from the North, Midwest and South rode their Model-T Fords down to Florida and Miami and the boom in land sales began. After the Prohibition period and the heyday of the bootleggers, a new but still segregated Miami emerged from the Second World War. Miami Beach became a tourist mecca and once Disney World opened in Orlando, millions passed through Miami to reach it and Florida and Miami entered a new era of growth and development. It was Fidel Castro, however, who created present-day Miami by exiling over a million of Cuba’s middle class. Showing enormous entrepreneurial skill and an exuberant taste for life, Cubans and more recently, Brazilians, Venezuelans and Colombians created the first Latin and “tropical” city in the US. Anthony P. Maingot explores the momentous history and vibrant culture of this most cosmopolitan city. With the highest percentage of foreign-born residents in the US, Miami is a melting-pot of music, dance, visual arts, cuisine sports and political argument. Maingot reveals how this unique cultural mix keeps the new city humming and ensures the perpetuation of its tropical joie de vivre. * City of migrants and tourists: “capital of Latin America and the Caribbean”; Little Havana and Little Haiti; exiles and entrepreneurs; the world’s biggest cruise ship hub. 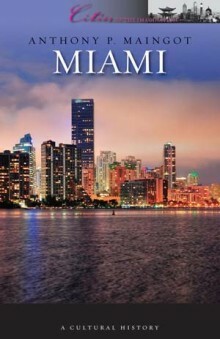 * City of crime: the Prohibition boom; Al Capone, Meyer Lansky and the mob; Miami Vice and modern-day drug crime. * City of culture: art deco architecture; the Latin recording industry; writers of the Caribbean diaspora; centre of performing arts. Anthony P. Maingot, Ph.D. is Professor Emeritus of Sociology and Founding Professor at Florida International University in Miami. He has lived in Miami since 1972.